Have I ever mentioned that I hate basting quilts? Oh, you say I've mentioned it several times? And discussed it at length? Ehhhh, I still hate it. I mean, it's my least favorite part of quilting, but it is still better than say, washing dishes. It's not even the act of basting that is the worst, it's the anticipation. I put it off, and put it off and don't get anything done because I feel like I can't sew anything else until I get that top basted. Today I bit the bullet and basted a top. I need to keep reminding myself that it isn't so bad, because it only took about 2 hours. 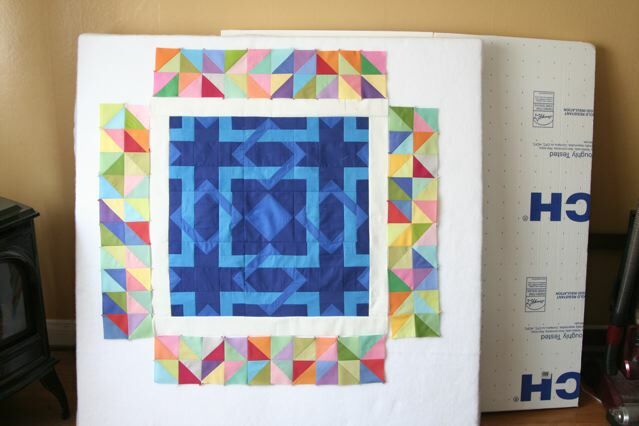 I finally basted it because I finally have something to do with a jelly roll I have. 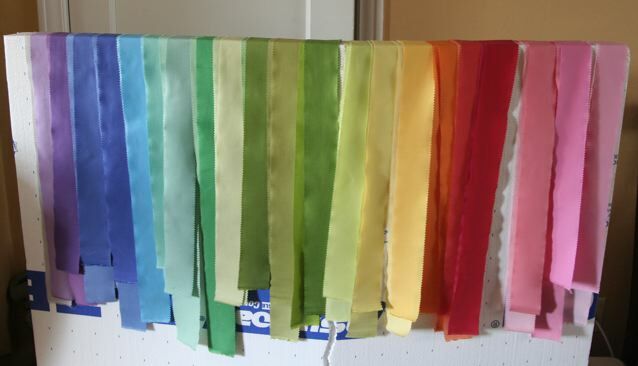 I ironed and sorted out all the colors, and I'm excited to start putting something together. I don't think I'm going to use the colors in this order, but I do love a good color rainbow. 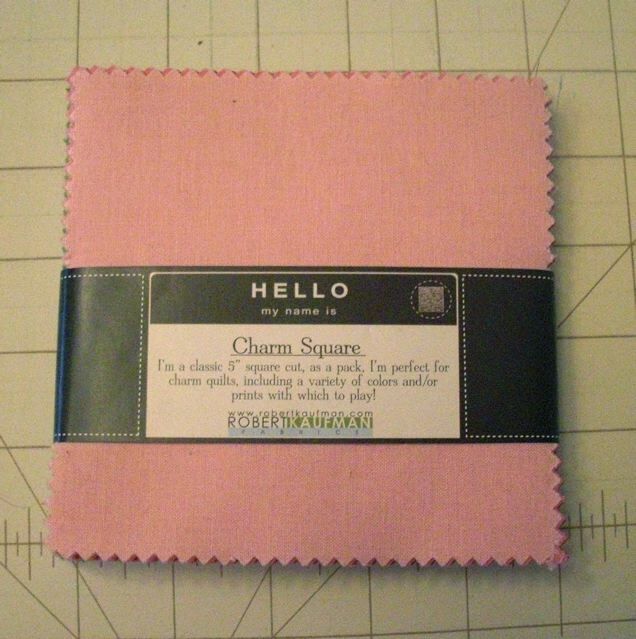 A few meetings of the PMQG back, we all received a free pack of solid charm squares. 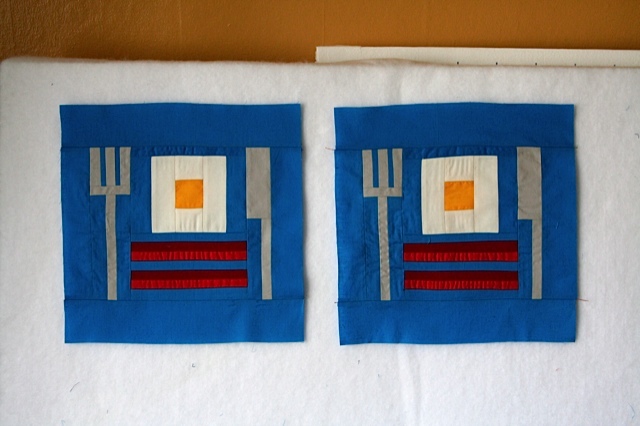 I had no immediate inspiration for these, so I decided to include them in my scrap quilt for 2011. I chose to make half square triangles out of them. I used the method described in this video. Basically, all you do is put two charm squares together, sew a quarter inch seam all around the edge, and then cut on both diagonals. You get 4 half square triangles out of it, which is nice. 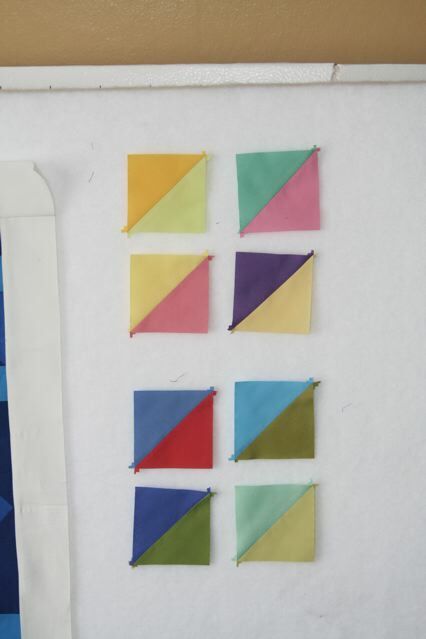 They end up being around 3 1/4 size, and if I were using them in a non-scrap quilt I'd cut them all down to 3 inches. I paired the colors randomly, by drawing them out of a paper bag. I like choosing the colors randomly, because I see a lot of color combinations that I wouldn't necessarily think of. I also get to see color combinations that I really don't like. The four on top were my least favorite combos, and the four on the bottom were color combinations that I found interesting, and might want to explore further. It's all subjective of course. I don't think that the color combinations on top are bad, just ones I am personally not that fond of. I really didn't like the pink and green one which is on the top right. I made this face when I saw it. It took me a minute to realize that it is the same color combo as my bathroom. 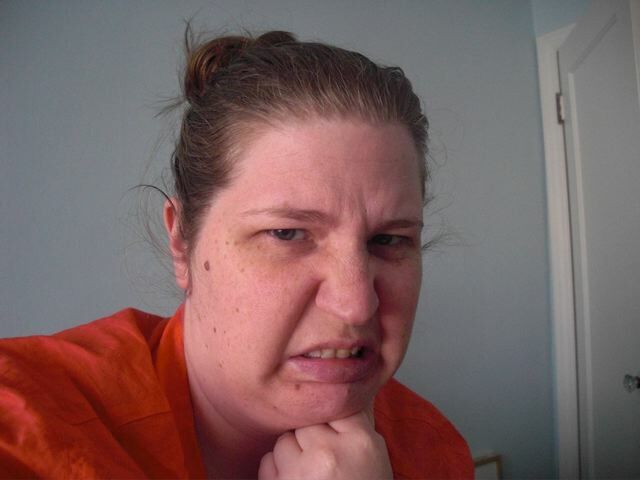 In fact, when I saw that color combo in the bathroom for the first time, this is the face I made. 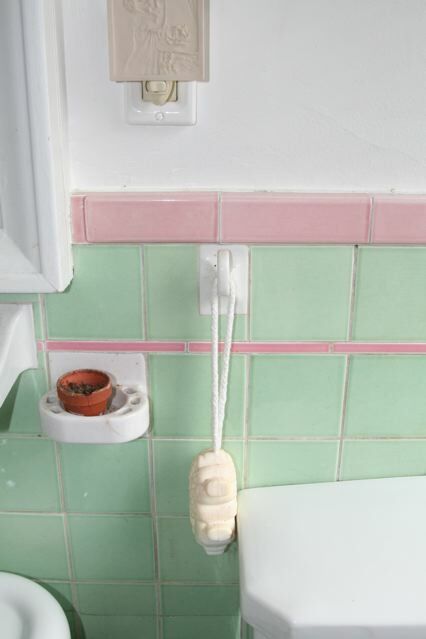 I think I just am not a huge fan of green and pink, but every time I tell someone I don't like the colors of the tile in my bathroom they say I'm crazy, so what do I know? 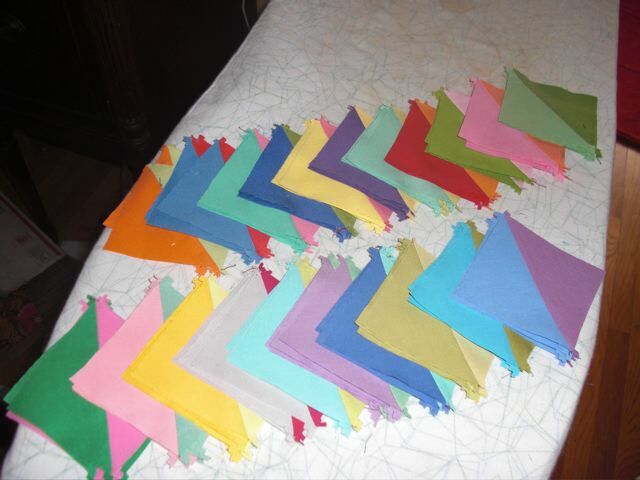 I sewed all the half square triangles together randomly, and am going to use them to border the center piece I made. 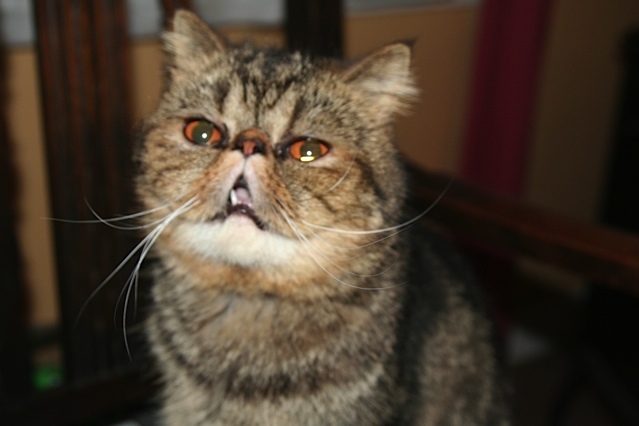 And, because I will never, ever stop posting pictures of my cat, here is some more stuff about Fritz! The other day I went downstairs, and didn't see Fritz anywhere. It was a little odd, and as the day went on I still couldn't find him. Eventually, I figured out that he was in a box off stuff behind a chair. I looked through the box to make sure there wasn't anything he could ruin inside, and ran across a book about quilting that I had bought over the summer. It had this great piece of advice in it. It reads: If a pattern calls for a solid color, consider substituting a mottled tone-on-tone print or a small allover print that "reads" as a solid. 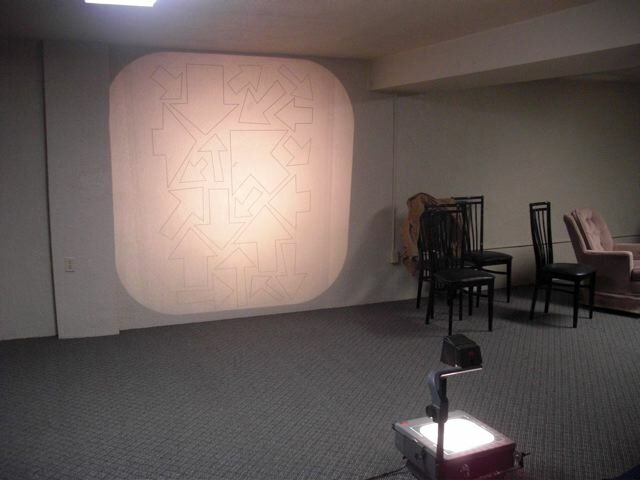 This kind of print can help hide inaccuracies in piecing and in quilting the layers together. 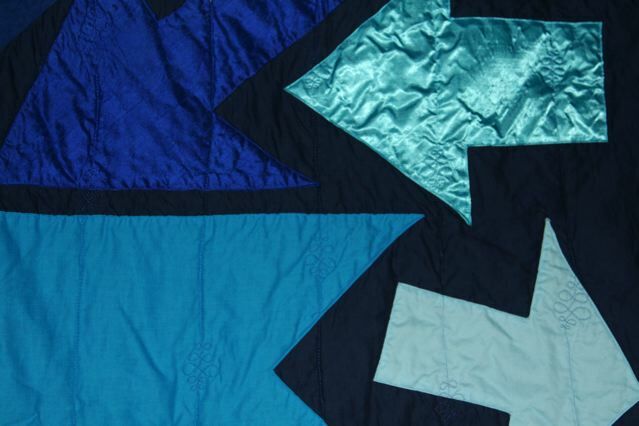 The subtle changes in color add movement and textural interest to the quilt that isn't possible with solid colors. 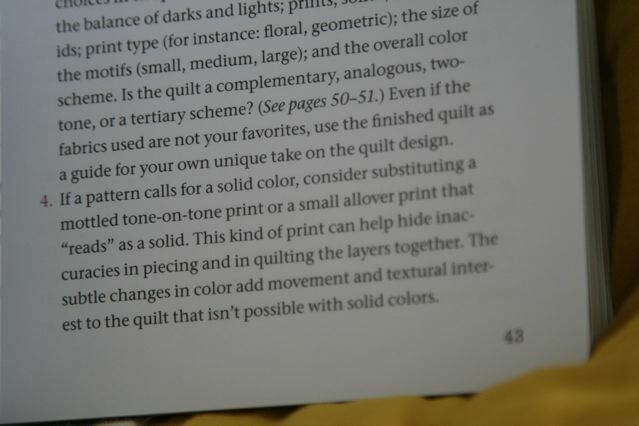 I mean, I obviously disagree, because I exclusively use solid color fabric. I find it kind of hilarious. 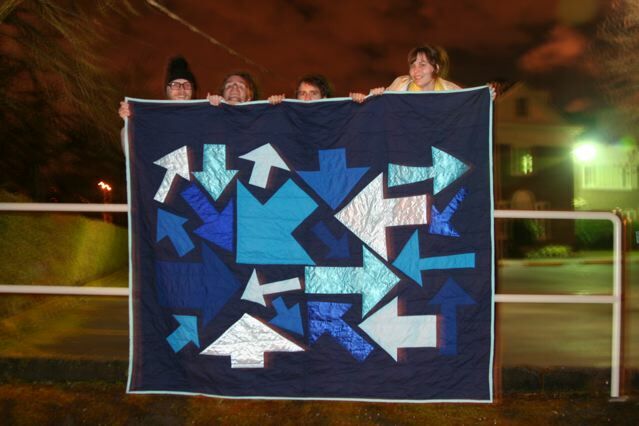 This is obviously not the best quilt guide for me. 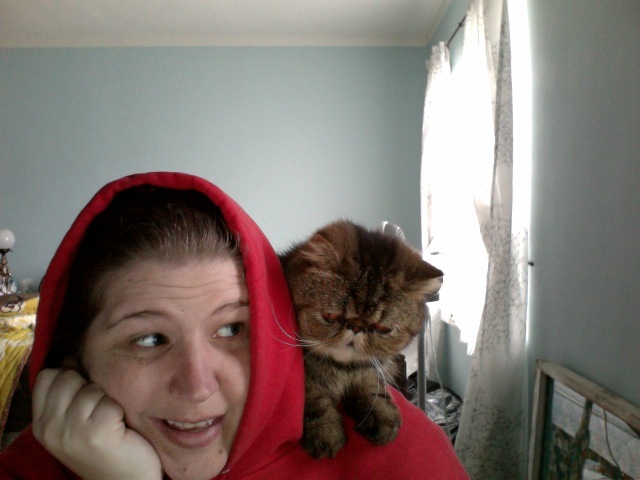 Did I ever mention that I really enjoy working from home? 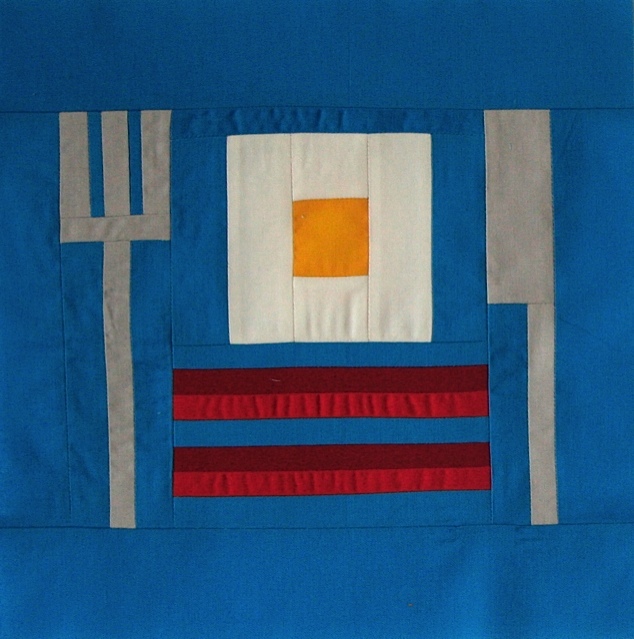 The project modern monochromatic challenge is over, and my friend and fellow PMQG member Jill is one of the winners for her awesome yellow quilt. Congratulations Jill! Well done and well deserved! 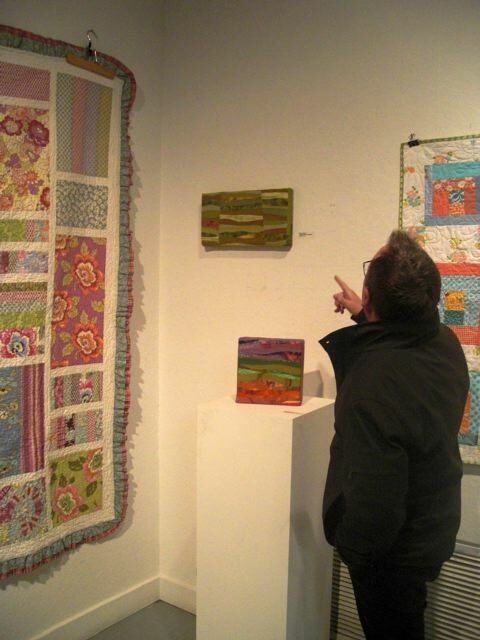 In fact, I think the PMQG put together a lot of great quilts for the challenge. Here is my quilt. It's about 72 x 88. I really enjoyed the process of making this quilt, even if I don't love everything about the final outcome. I really wanted a certain range of blues, and to get that I pulled probably every bold of solid blue fabric at Joann's, regardless of what the fabric was made of. 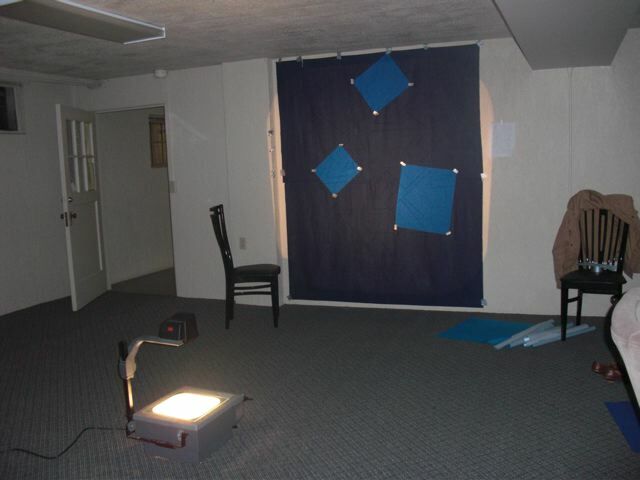 To make the arrow shapes, I used an overhead projector to trace the shapes onto pieces of fabric. This is where I'm glad my building has a meeting room, because there is no way I would have been able to do this in my narrow apartment! 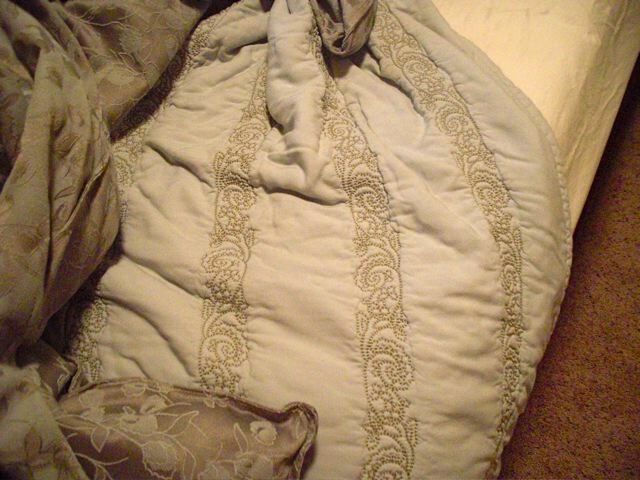 I quilted it very simply. 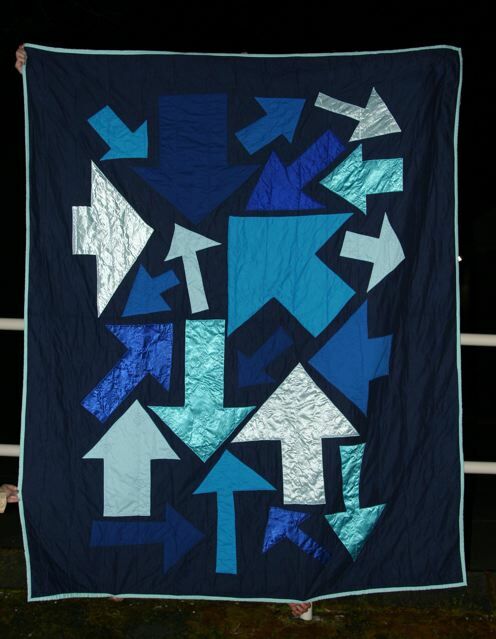 I appliqued all the arrows on as part of the quilting process, which worked out pretty well. I used wonder under for the shiny fabrics, but I sort of wish I had used it for all of them because some of the cotton fabrics, especially the large pieces got some tucking going on with the quilting. 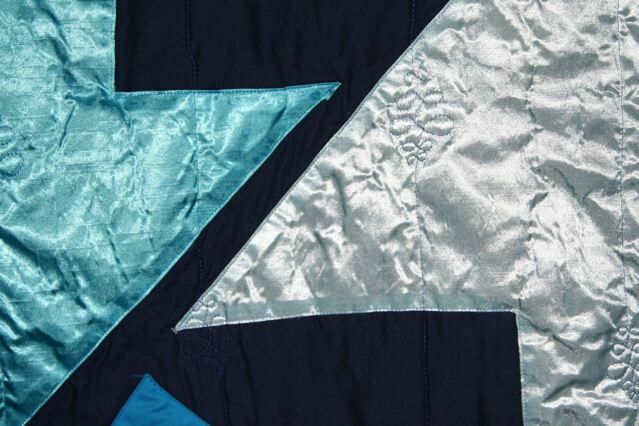 If I were going to do a project like this again, I would definitely use fusible or interfacing for all the applique pieces. For my first applique quilt, I think it turned out okay. Taking pictures of the quilt was pretty fun, and this time I made sure to take a photo of everyone who helped me hold it up. I've missed out on a lot of swaps at the guild lately, and it's mostly due to my own laziness. The last swap was a mug rug swap, which I totally forgot about until I met up with some people ahead of time and saw all of their mug rugs to swap. Luckily, my friend Jill had made two mug rugs, and is the kind of person that when she came into the meeting and I yelled across the room "Jill, give me one of your mug rugs to swap because I am lazy and forgot to make one!" she said "Sure!". I mention it because for once, I am not making my swap item at the very last minute. In fact, the meeting is almost a week away and I am done, done, done! If you haven't known me long, this should tip you off as to what I think about 95% of the time. When I was thinking about this swap, I initially thought that it was going to be a straight swap, a solid block for a solid block. I wanted to make a block that someone could get and either incorporate into a larger project, or use without adding anything at all. Then I read on the guild blog that what was really happening is that we are giving our block to someone else and they will do something (unknown at this time) and then give it back to us at the next meeting. Well, that's even better! I really like this block, and am happy to have it back. Problem is, now I want more blocks like this. I have a whole page of sketches of different foods so far, but we'll see if it goes beyond that. 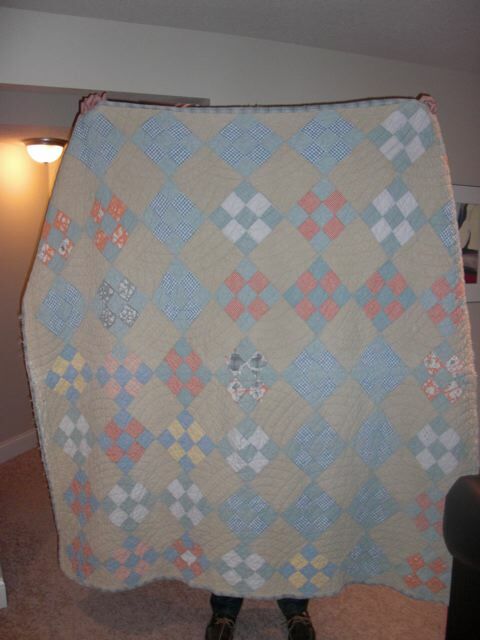 I think a quilt in this style could be neat though. Just in case I do make a quilt with this theme, I made the block twice. One for the swap, and one for me. I like that the one on the right is slightly deformed. In other news, Fritz continues to cycle through places in my house. Now, when I say cycling through, I mean that he exclusively lives in that part of the house, and would only leave it to eat and use the litter box. If you remove him from that area, he will run as fast as he can back to it, but he won't stay there permanently. He has to move on at some point and start again. He's a little nuts. He started with the kitchen, then the living room windowsill, then the bathroom, and, for a short time, the sewing room windowsill. 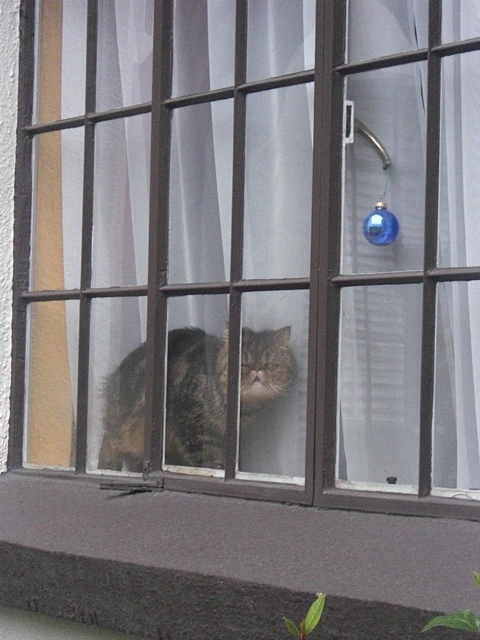 This was sort of fun, because I could always see him when I was entering the house. Less fun was the fact that he kept knocking the curtain down. That was short lived. He then moved to the top of the box my new computer came in. This was also fun, because it doubled as a scratching post. 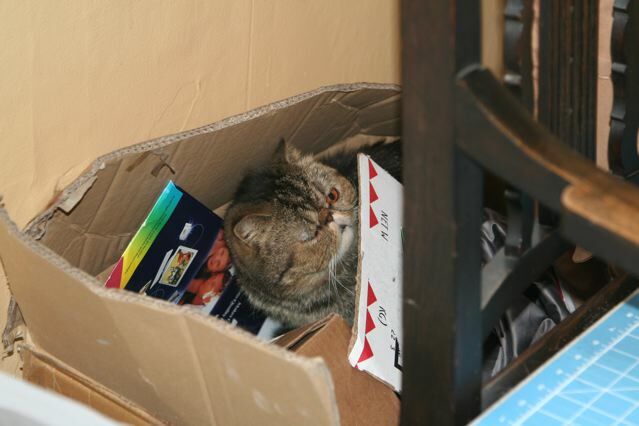 The box was an interesting place, only because I was in the room when he decided he didn't want to live there any more. He wandered around the room, darting back and forth mewing pathetically. He'd sit on a lot of things and refuse to settle. 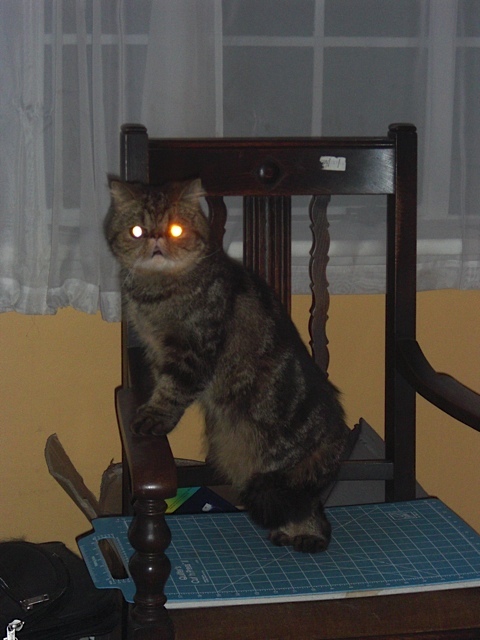 Finally, I put a board on one of the chairs, and he settled in. For Fritz, settling in is a relative term. Even though he is totally nuts, I can't help but love his stupid, stupid face. Honestly, normal cats look strange to me. 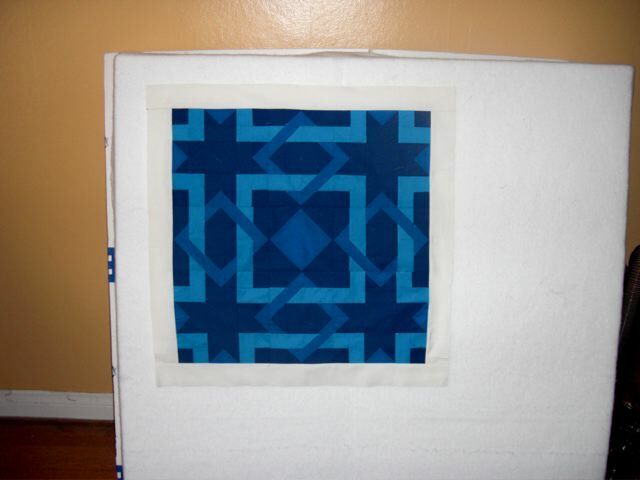 My quilt for the second project modern challenge is finished, washed, and photographed. I have my scrap quilt to baste (ugh), an idea rattling around for the third project modern challenge, but I don't have a quilt that I'm really working on. 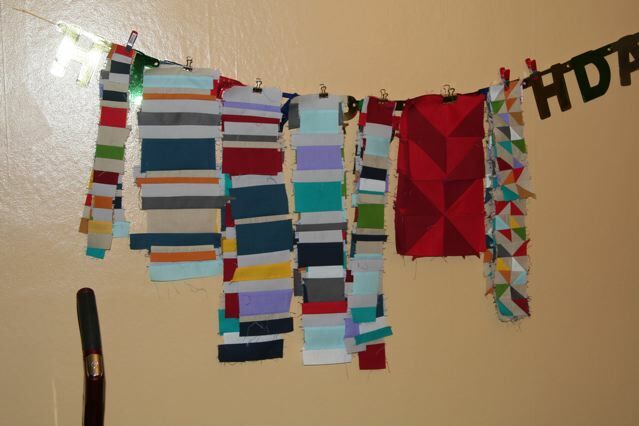 I don't want to baste my scrap quilt quite yet, I just did all that with my monochromatic quilt and I could use a bit of a break from that kind of quilting stuff. I have a lot of leftover fabric from my monochromatic quilt, so the past few days I've been sort of playing around with it. I know I want to make another scrap quilt using the leftover fabric of quilts I make this year, and I want to make a medallion type quilt this time. I took my monochromatic scraps (for this block is was more like unused yardage) and made the center piece for the medallion. I used a pattern I've been sitting on for awhile, and wanted to test to see if it would be fun to make for a larger quilt. It was inspired by medieval tile patterns. I think this kind of block, but it needs some real precision work to look really good, so I'm not sure if I'll use it again. I'm also thrilled to use my new design boards that Paula gave me. She was getting rid of them, and I snapped them right up when she offered. They serve a much different role than my old "design wall", which was just a happy birthday banner. All bits and pieces from my last scrap quilt. I've gotten so used to that banner that I bet I'll use both the design wall that Paula gave me, as well as the banner for just holding stuff. On Thursday I went to the opening of the PMGQ show at PNCA, and it was great! There were a lot of people there who weren't involved with the guild at all, so it was nice that we were able to show the community what we are all about. I didn't even have to make anyone pose, this guy did it all on his own. There was also a lot of free, delicious food. What a perfect kind of event! I spent the weekend in Iowa for my Grandmother's funeral. It was bittersweet. The funeral was sad, but it was wonderful to spend time with my aunts, cousins, and cousin's children. 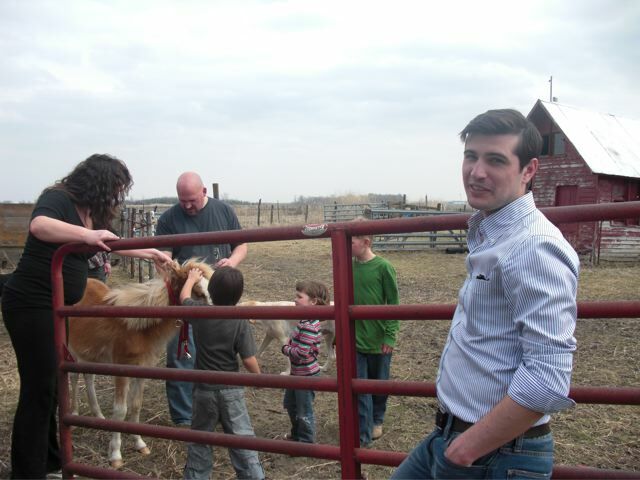 My cousin Joanna lives in Iowa, and on Sunday afternoon we went out to her farm. They have a four-wheeler. I used to have one too, when I lived out on the vineyard, so I'm pretty familiar with driving one. 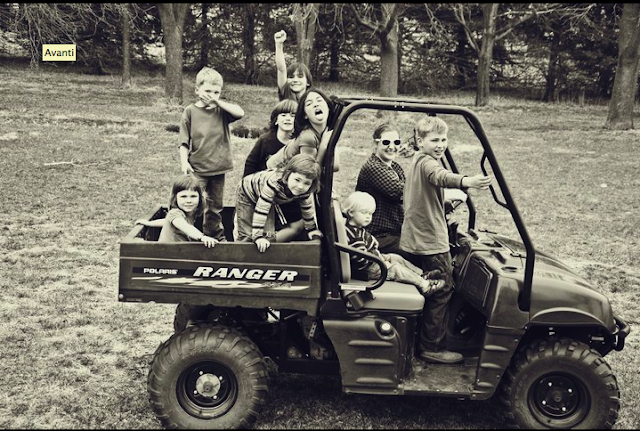 I will say that it is one thing to drive around with your friends, and another thing entirely to drive around with nine of your various cousin's children who are screaming for you to floor it. The oldest kid in the picture spent most of the afternoon driving all the other kids around, with some of the grown-ups rotating through to drive or ride. In this photo, I am calculating how quickly I can leave the country if something goes wrong. We didn't last as long as the kids, I think mainly because we were much more intensely aware that with one wrong turn we could wipe out half of the future generation of our family. Joanna also got a pony called Tina off of craigslist for $100 dollars, and she was a popular attraction for most people. My brother Andrew wasn't super impressed. Joanna says having a pony is sort of like having a really big rabbit. Andrew and I both stayed at my cousin Jenny's house. In Andrew's room there was this old quilt on the bed, and I forgot to ask Jenny who made it. It has beautifully hand quilted baptist fans, but the layout is very curious to me. The placement of the color blocks makes no sense to me, with the way the blues are all sort of jammed together in a few spaces, and everything seems both placed deliberately, but seemingly without any sort of overall plan. I've been toying with the idea of quilting in columns, and noticed the other bedspread in Andrew's room was embroidered with the same idea. It's something I definitely would like to try. All in all, it was a good trip, but I'm glad to be home.